FSU Art Professor Mark Messersmith’s solo exhibition, “Pay the Thunder No Mind – Listen to the Birds, and Hate Nobody,” is set to run through April 29th, 2017 at the Valley House Gallery in Dallas, TX. The exhibition title is adapted from a quote by Eubie Blake. 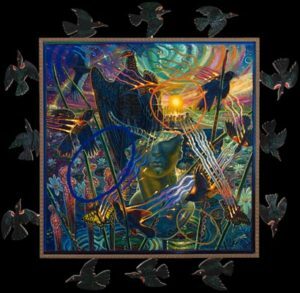 In lushly-colored paintings, Messersmith creates dense narratives packed with animals, birds, plants, and insects that express his concern for the shrinking world they inhabit. New to this exhibition are small paintings of birds. They are a dramatic shift in scale from his monumental paintings which are embellished with carved pediments and predellas that further the narratives and express his affection for Renaissance altarpieces and folk art. Messersmith was awarded the prestigious Joan Mitchell Foundation Award in Painting in 2006. Among the many museums that have collected his works are the Art Museum of Southeast Texas, The Grace Museum, Abilene, Texas, Jacksonville Museum of Modern Art, Musée du Haut-de-Cagnes, Ogden Museum of Southern Art, Huntsville Museum of Art, Huntsville, Alabama and the Tyler Museum of Art.